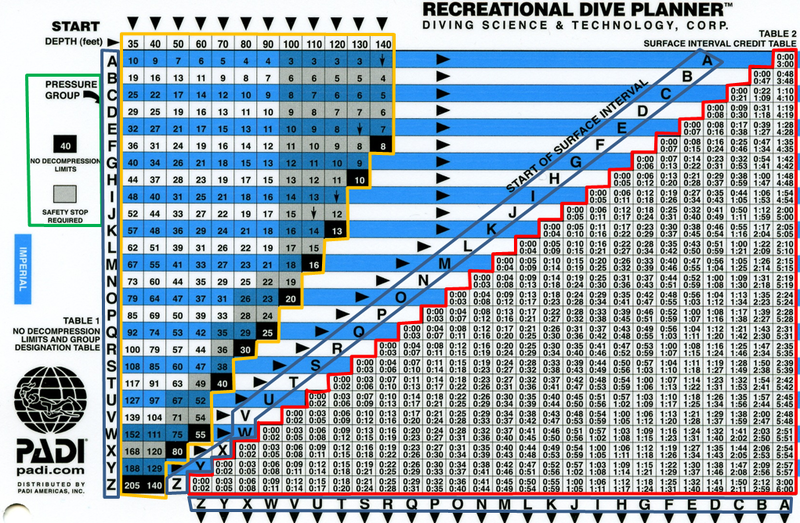 This multiple choice quiz is to test your knowledge and understanding of the Recreational Dive Planner, RDP. Questions will cover the tables, their purpose and ask a series of questions on the use of the RDP. At the end, your total will be displayed as a percentage of what you have answered correctly. This quiz is for entertainment purposes only and should not be use to base dives or a substitute for proper training. The quiz presumes you are beginning your first dive of the day and progresses from there. You will need to know the answer to the question being asked before moving onto the next question. The next question may depend on knowing what the answer to the previous question is. After submitting your answer by clicking on the Next Exercise button, you will know if you got the answer correct or not. If you answered incorrectly, click on the View Questions button to see what the correct answer is. Required Recommended material, an Imperial RDP. Recommended material, paper, pencil and a straight edge. Thank you for walking through Divetalking’s Quiz on the PADI Sanctioned Imperial RDP. We hope this quiz helped in understanding the RDP. Please check back often for new quizzes added to our repository on aquatic related subjects. What pressure group will you end up in after a 24 minute dive to 76 feet? Oops, this is where a straight edge may have come in handy or you forgot an important rule or two. Remember to round up the depth and/or the time if the exact depth and/or time is not found. under the 80 foot column should have been rounded up to 25 minutes. When diving a depth not displayed at the top or locating a time for a depth that is not found, what rule do you follow? You spend 1 hour and 5 minutes on your Surface Interval. What Pressure Group do you end your Surface Interval in? You are correct! You have entered into Pressure Group D after a 1 hour and 5 minute Surface Interval. Oops. Here a straight edge may be helpful. 1 hour and 5 minutes should take you to a box containing the time range. Scan down from the box containing the time range to where you find the Pressure Group. What just happened is you exited your first dive in Pressure Group N and after spending 1 hour and 5 minutes on the surface, you were brought to a new Pressure Group. Find the Pressure Group N and move to the right, into Table 2 and continue on that straight line to the right, locate the box containing the pair of numbers (representing a range of time) that include the time you spent on the Surface of 1 hour and 5 minutes. This should lead you to a box containing the time pair of 1:00 / 1:08. 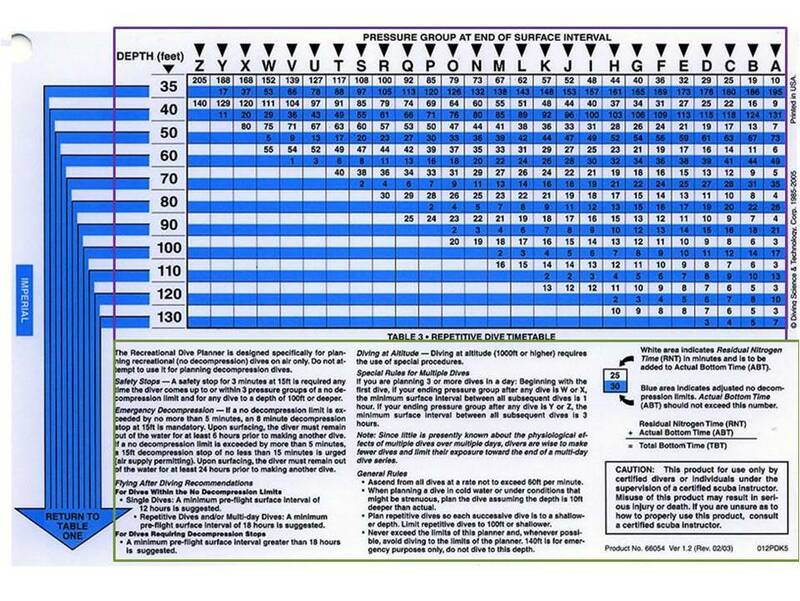 Following the column where the pair of numbers reside, downward until you read the Pressure Group and in this case, Pressure Group D.
Using Table 3, what is your Residual Nitrogen Time, RNT for a second dive to 56 feet? Nice Job. Looks like you are on the correct path showing your understanding of the RDP. Hmm, what went wrong? Did you forget to round the depth to the next higher level, 60 feet? Perhaps the straight edge could help? You ended your first Surface Interval of 1 hour and 5 minutes in Pressure Group D. Flipping the RDP over to table three, locate the coordinates for the D Pressure Group and the numbered pairs for the planned depth of your second dive to 56 feet. You will be brought to a box containing two colored boxes, White on top and Blue on the bottom. Which of the two boxes containing the value for your Residual Nitrogen Time, RNT? Using table 3, What is your Adjusted No Decompression Limit for planned second dive to 56 feet while in a Pressure Group D? Hmm… Looking at the two numbers found in the box where Pressure Group D and the depth of 60 feet intersect, the number on the blue box indicates your Adjusted No Decompression Limit. Looking at the two numbers found in the box where Pressure Group D and the depth of your planned second dive intersect. The number on the blue box indicates your Adjusted No Decompression Limit. You have established your Adjusted No Decompression Limit, ABT to be 39 minutes. You plan your second dive to 56 feet for 34 minutes. What Pressure Group will you exit the water at? Oh my, what happen? Did you forget to add your Residual Nitrogen Time, RNT to your Actual Bottom Time, ABT? You know the depth of your second dive, you know your Actual Bottom Time, ABT… What’s missing? Use your Legend on the back of the RDP for a clue. You have just surfaced from your second dive to 56 feet for 34 minutes and are in Pressure Group U. After spending 1 hour and 14 minutes (1:14) on the surface, what is your Pressure Group? Correct! You entered into Pressure Group F after spending a 1 hour and 14 minutes (1:14) Surface Interval. Oops. Perhaps a Clue may help. Consider using a straight edge. Following the line from table 1 for Pressure Group U to the pair of numbers that encompass the time you spent on the surface (1:14), then following that column downwards, you should be brought to the new Pressure Group. Following the line from table 1 for Pressure Group U over to the right and into Table 2, you will find a pair of numbers that encompass the time you spent on the surface (1:14). Following the column downward, should bring you to the new Pressure Group. You have established that after your Surface Interval of 1 hour and 14 minutes after the second dive, you are in Pressure Group F. For your third and final dive for the day, you plan a depth of 47 feet. What is the MAXimum amount of bottom time you are allowed without going into decompression? Correct. The Pressure Group F and the 50 foot depth intersect at the box containing 24/56, where the number in the blue box, 56 represents your Adjusted No Decompression Limit, NDL. Oops. Make sure you are staying in line by using a straight edge. Or perhaps you forgot to use the 50 foot depth. You should be brought to the numbers 24/56 where the 56 represents your Adjusted No Decompression Limit, NDL. See the legend for an explanation. We have established you are in Pressure Group F. Did you use the correct depth? Perhaps got a little of track when looking for the numbers where Pressure Group and Depth intersect. If you did not use a straight edge, try using that. Using Pressure Group F and the depth of 47 feet, what is your Residual Nitrogen Time, RNT you will need to add to your Actual Bottom Time, ABT of your third dive? Correct. 24 minutes of residual nitrogen remain in the body. This 24 minutes is subtracted from the 80 minutes allowed for 50 feet, resulting with an Adjusted No Decompression Time of 56 minutes. (56+24=80) or (80-24=56) or (80-56=24). Hmm… You should have used the number found in the white box, 24 where Pressure Group F and the 50 foot lines intersect. Look for the number on the white box where Pressure Group F and the 50 foot lines intersect. You are almost complete. Just two more questions to go. You are making your 3rd and final dive to 47 feet for 48 minutes. What is your Pressure Group at the end of this dive? Did you forget to add the Residual Nitrogen Time, RNT to your Actual Bottom Time, ABT to come up with your Total Bottom Time, TBT? See the legend on the back of the RDP for an explanation. Because your time and ending Pressure Group ended in one of the grey shaded boxes above the No Decompression Limit, what is required? A Safe Stop is required for a diver coming up to or within 3 pressure groups of the no decompression limit. See the legend on the back of the RDP. The answer is found in the second paragraph, first column.